The nonprofit arm of Priorities USA is undertaking a massive effort to collect voting data in Michigan by requesting copies of ballots cast in the 2016 elections across the state—but is doing so via an opaque limited liability company and not under the actual name of the group, whose super PAC counts George Soros as a top funder. Marc Elias, a partner at the D.C. office of the Perkins Coie law firm who acted as Hillary Clinton's top campaign lawyer, joined the board of Priorities USA last year to help spearhead voter-related efforts of its nonprofit arm, Priorities USA Foundation. Elias has led past efforts bankrolled by Soros that challenged voter ID laws. Priorities USA Foundation is now seeking the Michigan data under the name "United Impact Group LLC," which left local clerks "unnerved," the Detroit News reported. Priorities had contracted a third-party firm to help with the efforts and the city of Lansing alone said that it would take 275 hours for their staff to complete and cost $12,000. There is no information about United Impact Group online and lists its return address on the requests as a P.O Box in Astoria, N.Y. The requests were also signed by "Emily," with no last name provided. A search of New York state's corporation database shows that the LLC is not registered in that state. However, it does appear in Delaware registrations, a popular destination given the secrecy that comes with registering in the state. Its filings with the state of Delaware show that the LLC was incorporated on July 19 of this year. The efforts are not being done to contest 2016 election results but to "inform and bolster future voter right protections" and the information could be used for the likes of future lawsuits against voter identification laws, the Daily Beast noted. Efforts are focused on Midwestern states Trump narrowly carried and will include Wisconsin. Elias, who was just a few months removed as Clinton's top campaign lawyer when he joined Priorities USA's board, previously led legal challenges against voter identification laws before the 2016 elections. Elias conducted the challenges in his personal capacity as an attorney at Perkins Coie, although Clinton publicly backed the effort. Soros gave $9.5 million to Priorities USA's PAC throughout the 2016 elections while his son, Alex, added $1 million. 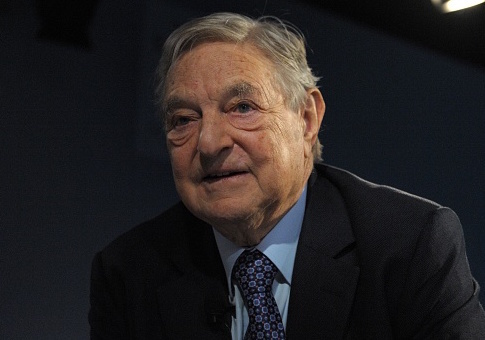 Soros has provided an additional $5 million to the PAC this cycle. The Priorities USA Foundation was established last year and does not have to disclose its donors. Soros also has a personal goal of expanding the electorate by 10 million voters and put millions of dollars into Elias's voter ID efforts. Elias filed lawsuits in states including Wisconsin, Virginia, North Carolina, and Ohio. The Ohio Organizing Collaborative, the initial group Elias had put on the lawsuit in Ohio, later found itself under investigation for submitting fraudulent voter registration forms, including registering dead people. A source close to Elias at the time told the Washington Free Beacon that he had not been involved with the group since it was replaced as plaintiff. A woman who worked for the Ohio Organizing Collaborative ultimately pled guilty to falsely registering people to vote and was sentenced to six months in prison. Elias did not return a request for comment on Priorities' current efforts in Michigan to collect the ballots. Following Trump's victory, Democrats quickly mobilized a large network to combat voter ID laws. In addition to Priorities tapping Elias to lead the voter efforts, which seeks to build a national database to be the "one-stop inventory of restrictive voting measures" that will be shared with other progressive groups, other liberal groups popped up with the same mission. Jason Kander, the former Democratic Missouri secretary of state who has been floated a potential 2020 presidential candidate, launched one such nonprofit called Let America Vote. Guy Cecil, chairman of Priorities USA, and Elias both sit on Let America Vote's advisory board. This entry was posted in Politics and tagged 2016 Election, George Soros, Hillary Clinton, Michigan. Bookmark the permalink.